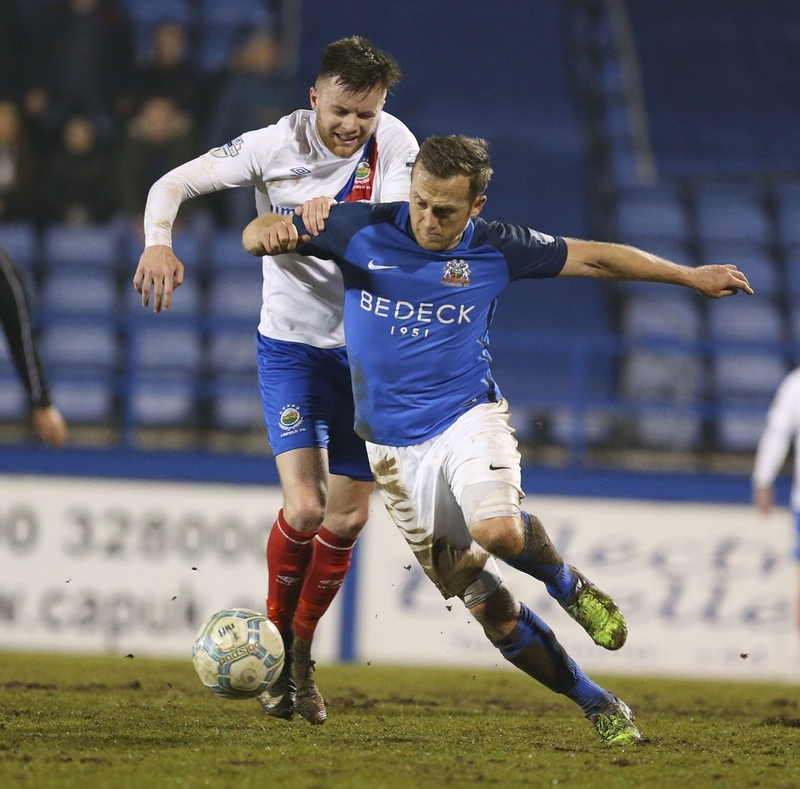 Glenavon came out on the wrong end of a five-goal thriller in the third-versus-fourth clash at Mourneview Park on Tuesday night as Linfield hauled themselves level on points with the Lurgan Blues. Kurtis Byrne, son of former Glenavon midfielder Paul Byrne, opened the scoring for the visitors in the second minute when he turned in Mark Stafford’s header from a Niall Quinn corner. 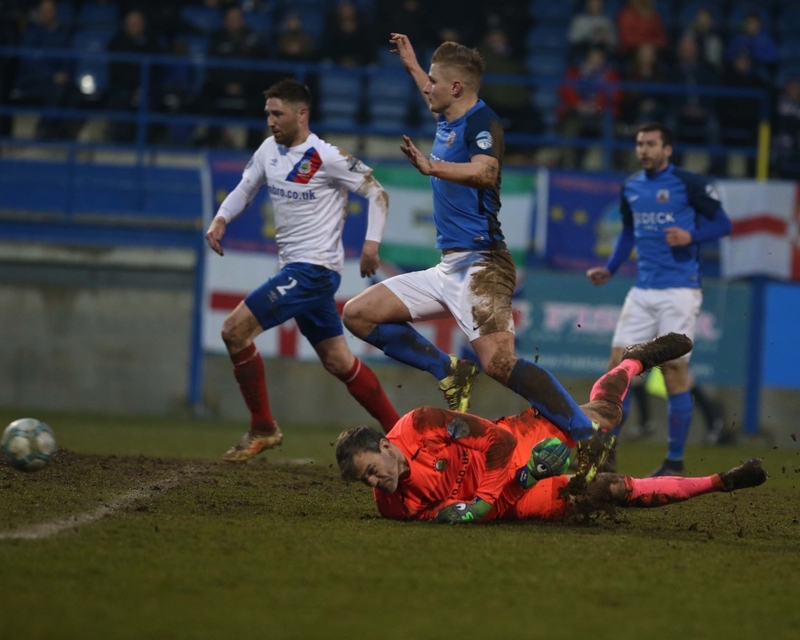 The hosts responded in the 24th minute when top scorer Andrew Mitchell slotted the ball underneath Roy Carroll to equalise, but Linfield regained the lead just three minutes later when Andrew Waterworth glanced a header inside Jonathan Tuffey’s far post following a Quinn cross. Glenavon scored a second equaliser on 54 minutes through Bobby Burns, only for them to concede straight afterwards once again, as Stephen Lowry beat Tuffey at the second time of asking to score what proved to be the winning goal. Linfield should have opened the scoring in the first minute of the match. James Singleton did well initially to cut out an Andrew Mitchell pass that was intended for Kirk Millar, but when the full-back then failed to clear the ball he was robbed of it by Lowry. Tuffey kept out the midfielder’s first effort, while his second struck the base of the post before the ball was put behind for a corner. However, the visitors were not to rue that missed opportunity, as they took the lead from the resulting corner-kick. It was Quinn who swung the ball in, and Stafford leapt at the back post to meet it with his head and turn it goalward. Byrne was on hand to turn the ball over the line with his head. In the fifth minute Sammy Clingan had an effort on goal from a free-kick, forcing former international teammate Carroll to tip the ball over the bar. Two minutes later Josh Daniels nearly got in on goal when he attempted a one-two with Mitchell, but the striker just couldn’t get the right touch on the ball to send the winger clear, while on 11 minutes Stafford made an excellent intervention to cut out a dangerous Cooper cross. At the other end Simon Kelly had to time his tackle to perfection to deny Waterworth a clear run on goal. Kelly then had a goal ruled out at a Burns corner when referee Andrew Davey decided that a foul had been committed on Carroll. Glenavon drew level in the 24th minute. Clingan played a ball up to the edge of the penalty area that picked out the head of Marshall. The right-back glanced his header beyond Stafford and into the path of Mitchell, who slid the ball beneath Carroll to make it 1 – 1. 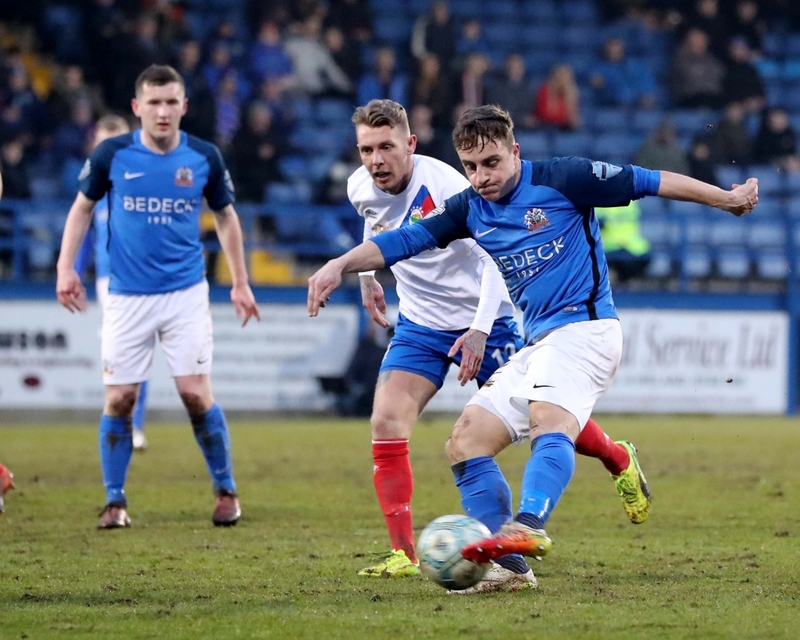 Glenavon were on level terms for only three minutes, as Linfield struck once again at a Quinn corner. Tuffey punched the initial cross clear, before Andrew Doyle blocked Mitchell’s follow-up. When the ball found its way back to Quinn he whipped in another cross with his left foot and this one picked out Waterworth, who expertly guided his header inside the far post to restore the visitors’ lead. Glenavon almost hit back straight away themselves at a Clingan corner-kick when Stephen Murray struck a wicked volley with his left foot which was cleared off the line by Matthew Clarke. Replays suggest the Linfield defender may have used his arm to keep Murray’s effort out. Glenavon started the second half brightly, and they were rewarded with a second equalising goal on 54 minutes. Clingan played the ball wide to Cooper, and he in turn played it inside to Singleton. Singleton then turned and drilled a low cross into the six-yard box which found Burns, who guided the ball into the net with his right foot. 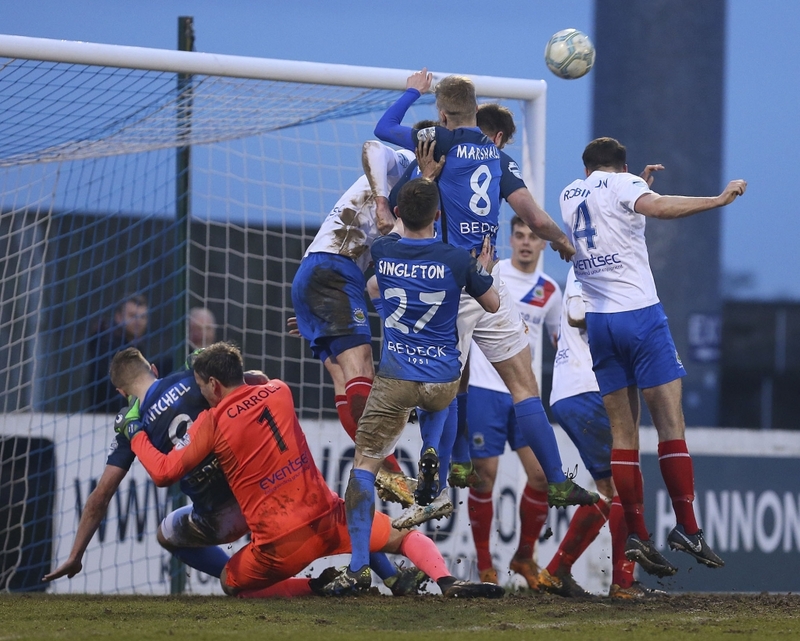 It was a case of déjà vu for the Lurgan Blues as they handed the lead back to Linfield almost immediately on a second occasion. This time they were level for less than a minute. From the restart the ball was fed wide to Clarke and his low cross picked out Lowry inside the penalty area. 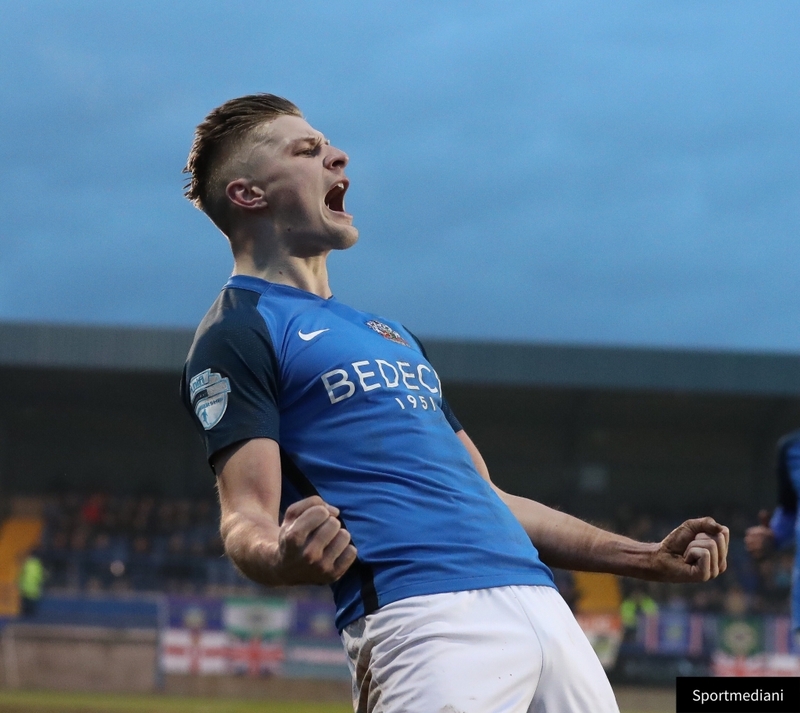 Tuffey was equal to the midfielder’s initial effort, but he could do nothing to keep out the follow-up as Glenavon were ruthlessly punished for another lapse in concentration. Five minutes later Tuffey spread himself brilliantly to deny Waterworth a second goal after the striker had skipped clear of Clingan’s challenge following a ball through from Lowry. Glenavon went in search of a third equaliser. Mitchell laid the ball off for substitute Robbie Norton, but Carroll was equal to the young midfielder’s shot from distance, diving to his right to tip the ball round the post. The closest Glenavon came to a third goal was a Murray effort a minute from time, when he curled a left-footed shot in from the corner of the penalty area which went narrowly wide of the far post. 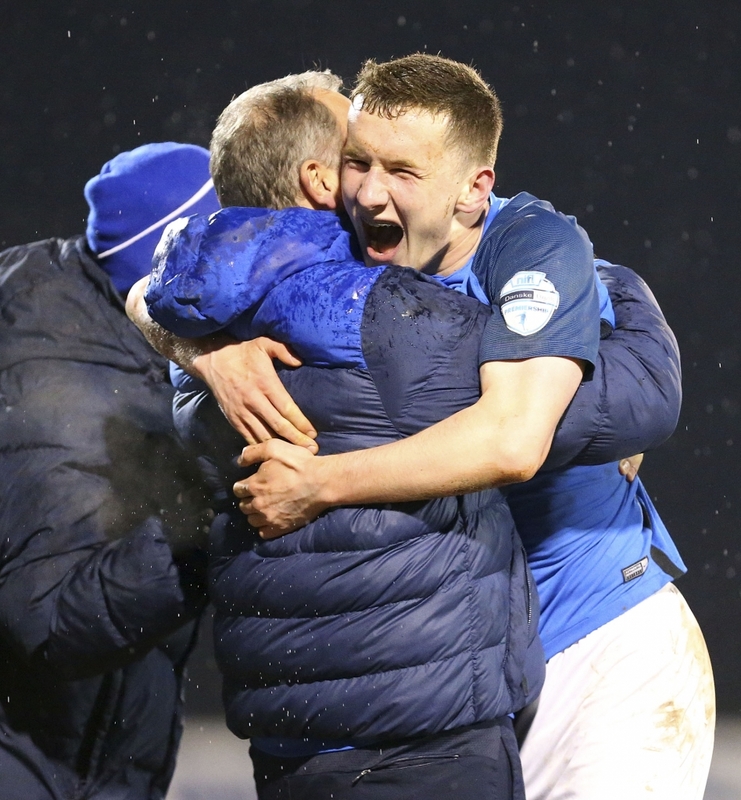 Linfield held on for the victory; a result which draws them level on 63 points with Glenavon, who remain in third place by virtue of their superior goal difference. Meanwhile, Cliftonville, who defeated Ballymena United 3 – 0 on Tuesday night, are just two points further back in fifth place, as the race for third spot hots up heading into the final four rounds of fixtures. The Lurgan Blues face another massive test on Saturday (April 7th) as they travel to Seaview to take on league leaders Crusaders. Glenavon produced arguably their finest performance of the season at Seaview back in October when they beat the Crues 3 – 2, and they know that they will have to produce a performance of a similarly high standard if they are to have any chance of defeating the team that humbled them less than a month ago in a devastating 6 – 1 display at Mourneview Park.